First of all, the homolinguistic translation is a kind of barbarism, a kind of appropriation, a form of simulacra that – and I only thought of this at the KSW colloquium that I participated in last year in Vancouver – is not much different from the colonial way in which, for example, the Coastal Squamish word Khatsalano became Kitsilano. Second, the kind of words that emerged is a record both of my own memory & history & of the contemporary moment: thus Morgan Freeman but also my aunt’s name (Hatty), and such other proper names […]. Third then, what is this poetry not doing? It’s not about myself, even though those references end up in there; it’s not an expression: lines like “i be grief” or “guys decent?” obviously carry a resonance from everyday language, from its fragmentary nature … in most, if not all of my work then, there’s an attempt to be awake to that everyday language, to how it works, to how it flows, to get some of that down on the page, not to have meaning, just to have language. It’s interesting that Burnham acknowledges the cultural conflicts that arise inside translation, and the question of, exactly, what is this poetry doing or not? Translation, one might argue, is a deceptive genre, less a matter of replicating someone else’s writing into another language but composing an entirely new work. To see two different translations side-by-side of the same work into English, and it becomes obvious that language isn’t a series of strict rules, but one of choices, different directions and preferences. Words in one language might be entirely precise, but not even exist in another. In his “afterword,” Burnham mentions bpNichol’s Translating translating Apollinaire A Preliminary Report (Milwaukee, WI: Membrane Press, 1979; Nightboat Books, 2013) as an inspiration, but other translations along the same line exist in Canadian writing, including George Bowering’s Kerrisdale Elegies (Toronto ON: Coach House Press, 1986; Vancouver BC: Talonbooks, 2008), Mark Goldstein’s Tracelanguage: A Shared Breath (Toronto ON: BookThug, 2010), and Erin Mouré’s Sheep’s Vigil by a Fervent Person (Toronto ON: Anansi, 2001), among others. One could even include derek beaulieu’s experimental novel Local Colour (2008), as well. What is the language doing? A couple of years ago, I heard Calgary poet Christian Bök perform a series of works he had composed that, read as written, replicated exactly the sounds of certain video game screens. Ideas such as these certainly go deep into the possibilities of language in ways that further examples of lyric metaphor can’t even fathom. In Kerrisdale Elegies, Bowering claimed to be translating his own work from a language he didn’t know, transposing a narrative logic over a series of best-guesses. Burnham, on the other hand, works against meaning, following the logic of sound instead to achieve his pieces. 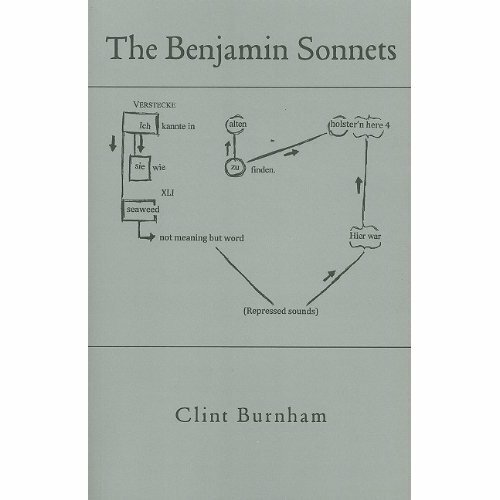 What is intriguing, in part, about these poems is the idea that, if you know the original language, might it be possible to reverse engineer Burnham’s poems into an approximation of the original text?